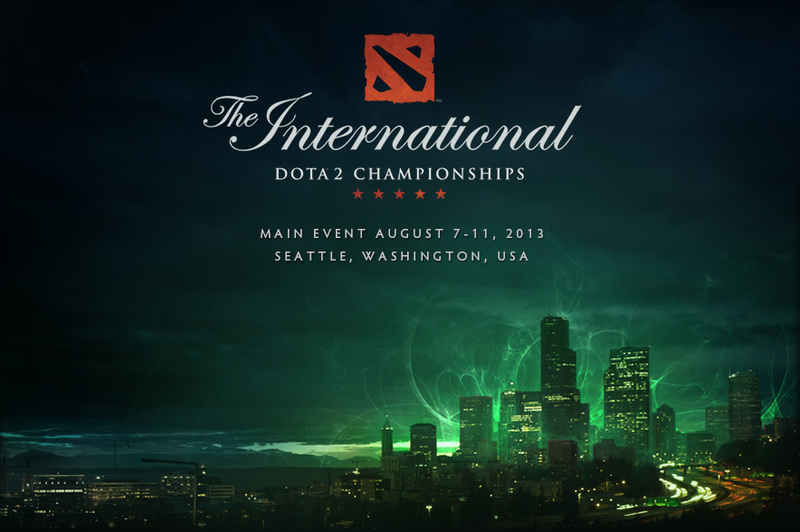 KL To Host SEA's BIGGEST DOTA 2 Tournament. Will M'sia Rise As Champions On Home Ground? Win RM350,000 and the title of Champions for Malaysia! How do you get the tickets? - Purchase the tickets at the pre-sale event at Thunder Match's Berjaya Times Square branch on 14 February from 10am to 3pm. - Those who purchase tickets will receive free gifts, among them are: 200 8GB USB3.0 thumb drives, 100 Dota 2 wristbands, as well as 40 Bitdefender Antivirus software which will be given away on a first-come, first-served basis. - The sale will happen online over 18 to 20 February 2015 at a special pre-sale price. - From 23 February 2015 to 15 March 2015, the tickets will be sold at the regular price. - Purchase the tickets at the event itself. 1. Head down to this exact Facebook post. 2. In that post, tell us which DOTA 2 hero will best adapt to the Malaysian lifestyle and culture and why. The more creative the better. For example: "Anti-Mage confirm can adapt into Malaysia for sure! Because he can use blink and teleport in and out of the Malaysian traffic jam easily mah"
3. The SAYS DOTA 2 Giveaway contest closes on 15 March 2015 at 11:59PM. Any comments after that will not be taken into consideration. 4. The grand prize is a pair of VIP passes, second and third-runner up will win a pair of Gold passes each, while the remaining 7 winners will receive a pair of regular passes. 5. Winning entries will be judged on creative merit and will be based on originality, humour and wit. All decisions are final and no other. 6. Winners will be contacted directly on 16 March 2015 via Facebook and will be given 48 hours to respond. Should the winners fail to respond within the given time, the prize will be forfeited and the next best entry will take the place. *Note: All tickets purchased will give the ticket holder access to all three days of the event from 20-22 March 2015. 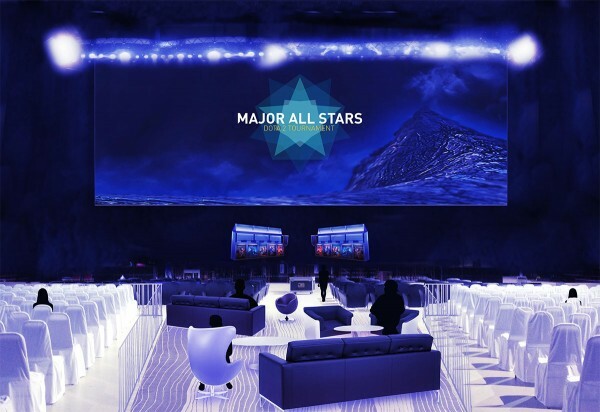 19 JAN: Have you always dreamt of attending an eSports tournament? 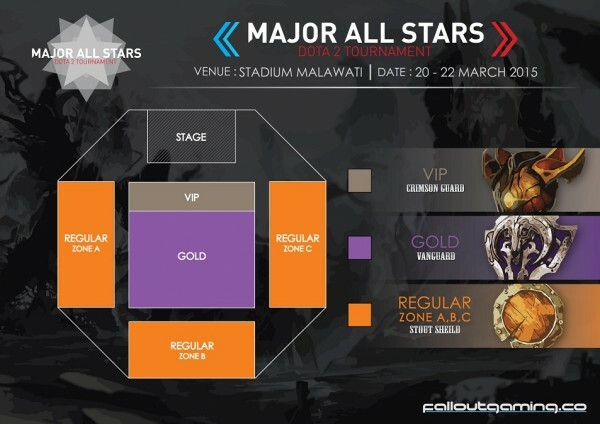 Well, that dream is now a reality thanks to the Major All Stars Dota 2 Tournament, which is set to happen right here in Kuala Lumpur in March 2015! 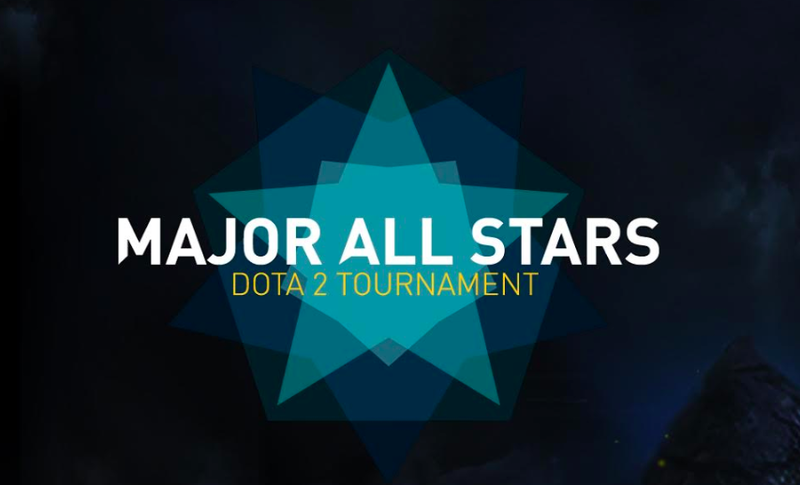 falloutgaming.co is proud to announce the Major All Stars Dota 2 Tournament! This will be the largest tournament of its kind ever held in South East Asia featuring both top international and local teams competing for a piece of the US$100,000 + crowd funding prize. 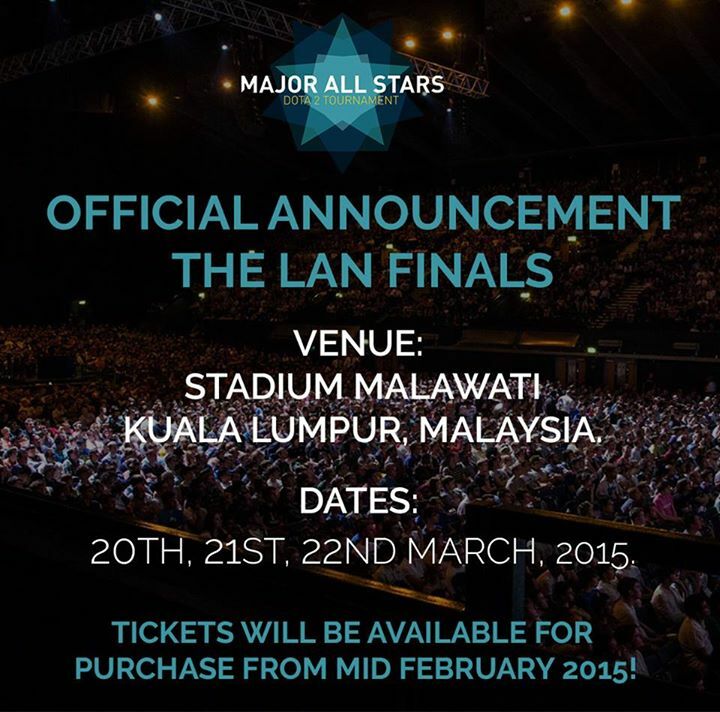 Qualifiers will be held from January to February with a LAN final in Kuala Lumpur , Malaysia in March 2015. The biggest Dota 2 event ever held in South East Asia will be held in Kuala Lumpur, Malaysia in March 2015. All our qualified teams will get an all-expenses paid trip to take part in what will be a new chapter in the South East Asian professional gaming scene and a shot at the $100,000 prize pool. The USD100,000 prize money is set to be the largest tournament of its kind to be held in South East Asia and may even grow bigger thanks to crowdfunding. That's kinda a big deal. This will be the largest tournament of its kind ever held in South East Asia featuring both top international and local teams competing for a piece of the US$100,000 + crowd funding prize. The qualifiers will be in January and February; all the teams who qualify for the tournament will get an all-expense-paid trip to the venue. 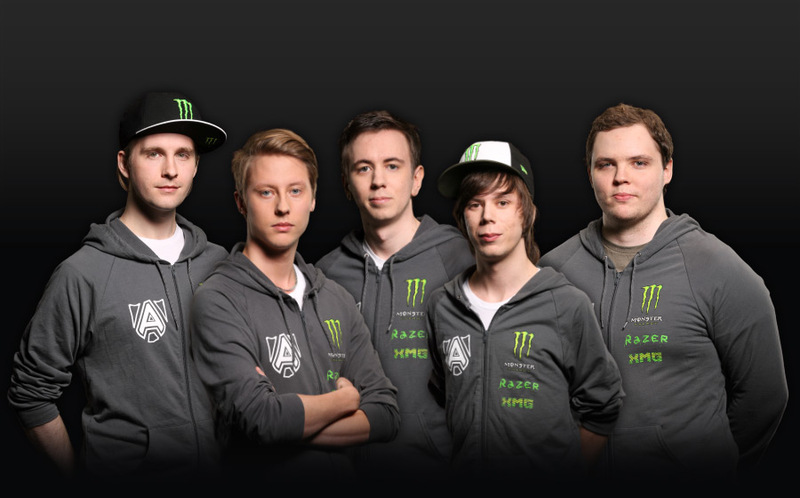 In addition, it will be a crowdfunded tournament with an initial prize pool of $100,000 (P4,472,500). 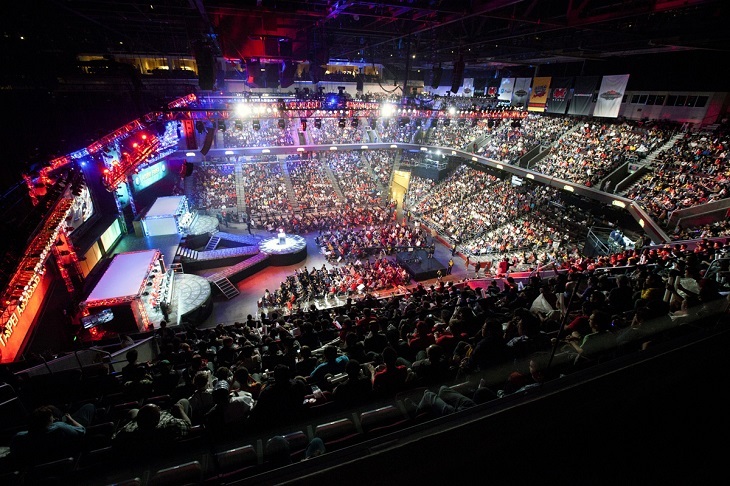 The prize pool can be increased through ticket sales and other sources of revenue. Why? You see, eSports is a multi billion dollar industry, and in regions like Europe or China, the prize pool is large enough to grow the scene. But in South East Asia, there aren't enough competitions and therefore this tournament is a refreshing change. 1. We know that e-sports in south east asia is growing exponentially and we'd like to fuel that growth and bring the community on par with the rest of the world. 2. Knowing that there is already a large following in e-sports, we want to create a new avenue for companies to access their potential customers. What this means for us is that our community will continue to grow! 1. There will be 8 teams competing in this tournament hailing from Europe, North America, China and South East Asia. Top teams outsides South East Asia will be invited to battle it out for four spots in the LAN final. INTERNATIONAL QUALIFIERS: Invitationals in each major international region with the top teams from China and North America and the top 2 teams from Europe winning a place in the LAN final. 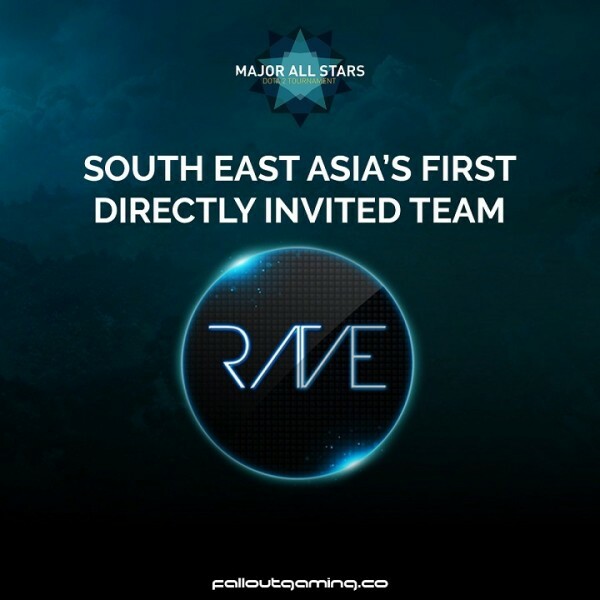 The first of the two invited teams are Philippines’ Rave, a professional e-sports team which is based and managed in South Korea. 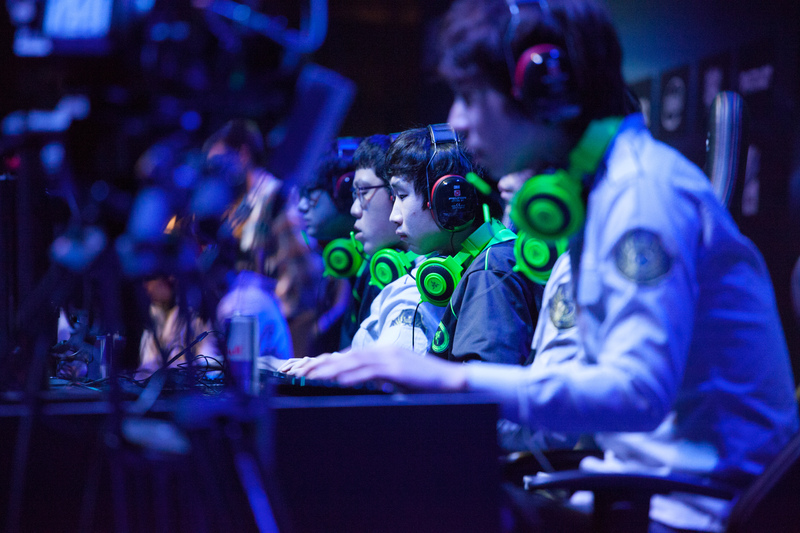 One of the top teams from the region, Rave finished first in the Korean Dota 2 League Season 4. The second confirmed team is none other than our very own Invasion e-Sports, one of Malaysia’s largest e-sports organisations with teams professionally participating in games such as Heroes of Newerth, CS:GO, Starcraft 2, League of Legends and of course, Dota 2. 3. This leaves just two more spots up for grabs! All you need is a Steam account and qualify your way through with your team. But do hurry because registration closes tomorrow, 21 January 2015! 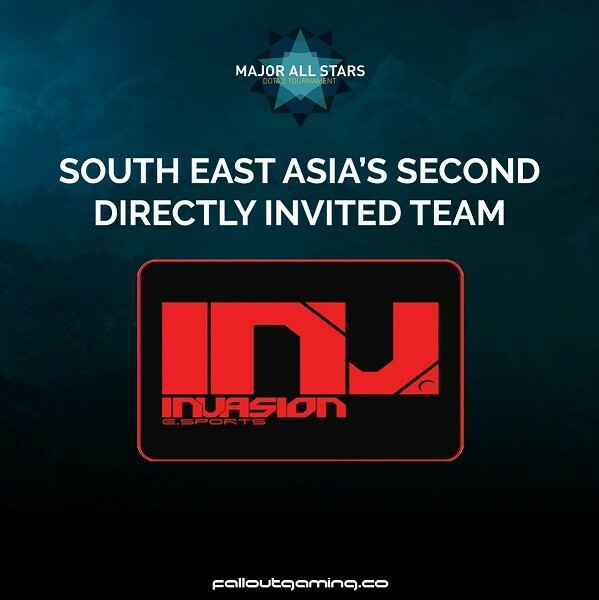 In addition, registrations for the open qualifiers in the South East Asian region of the Major All Stars tournament is now open. Anyone in the region interested to pit their skills can sign up now for free. 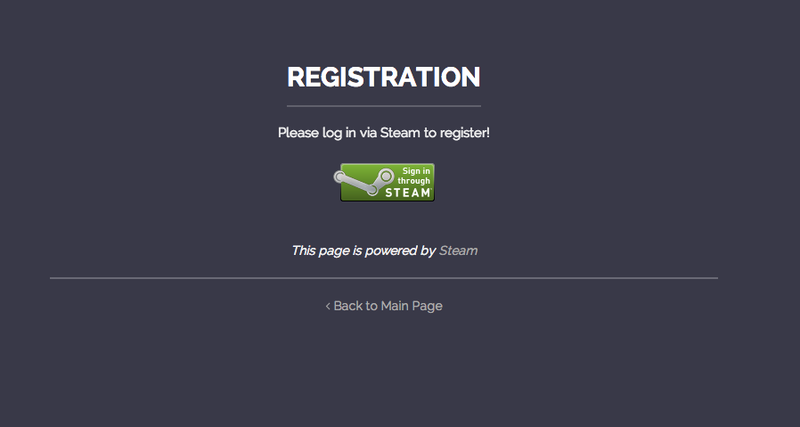 Upon registration, users will be required to register at www.falloutgaming.co, and then log in via your Steam account. You’ll have to go through a few more processes, and then you can choose either to join an existing team that has already registered, or create a new one where your friends can then join. Want to attend the LAN Final? SAYS will be giving out passes for it so stay tuned by following us on Facebook or Twitter for updates! "Ma, when I grow up, I'm going to be a professional gamer!" It's true, games do bring people together.